Welcome to the Pilotwings Flight Academy. You are a new recruit, whose aim is to qualify through the ranks by taking part in a series of aerial missions. Master using the biplane, parachute, hang glider and rocket pack. 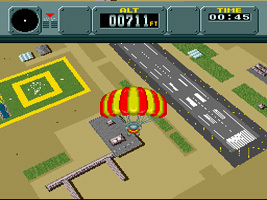 Your score in each mission often depends on flying the correct course through rings or balls and making a safe landing. You may also receive bonus points for the accuracy of your landing, and the amount of time or fuel remaining. As well as the main missions, you can also take part in several bonus missions, including Birdman, Penguin and Helicopter Combat, putting the skills you have learned to the ultimate test.